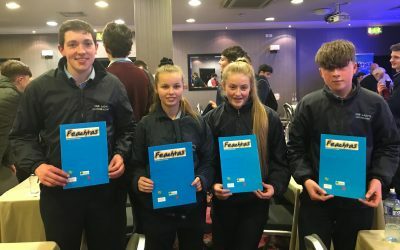 Chomhghairdeas do Darragh Ruddin, Kiera Walsh, Maria Duffy and Éanna Carey who took part in the National Final Tráth na gCeist Dé Máirt 12ú Márta 2019, this activity being one of many enjoyed by students in Our Lady’s as part of Seachtain na Gaeilge celebrations. 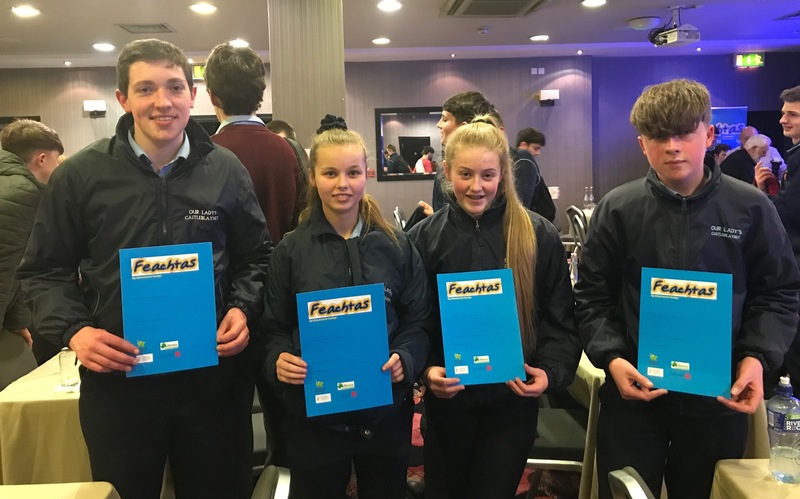 Congratulations to a group of students in Our Lady’s Secondary School who qualified for the National Final of Feachtas Tráth na gCeist, held in the Ashling Hotel, Dublin on Tuesday 12th March. This was a great achievement for students Darragh Ruddin, Kiera Walsh, Maria Duffy and Éanna Carey who acquitted themselves very well. The students enjoyed the experience and opportunity to use their Gaeilge in a fun and challenging way outside of the class. Comhgairdeas! Participation in Feachtas was one of the highlights of the Seachtain na Gaeilge celebrations held in Our Lady’s over the past few weeks. The very hard-working Coiste Gaeilge led the activities with Réamhaisnéis na hAimsire as Gaeilge ar maidin, lunchtime activites as Gaeilge, Tráth na gCeist, Comórtas Póstaeir, Gearrscannáin agus fiú amháin Scróráil Sciobtha(speed dating). There was something for everyone agus bhí craic again gan dabht. Congratulations to fifth year student, Caoimhe Gibbons, daughter of Martina and Paul Gibbons, who delivered a powerful and inspirational speech in the historical setting of Dublin Castle last Friday 8th March. 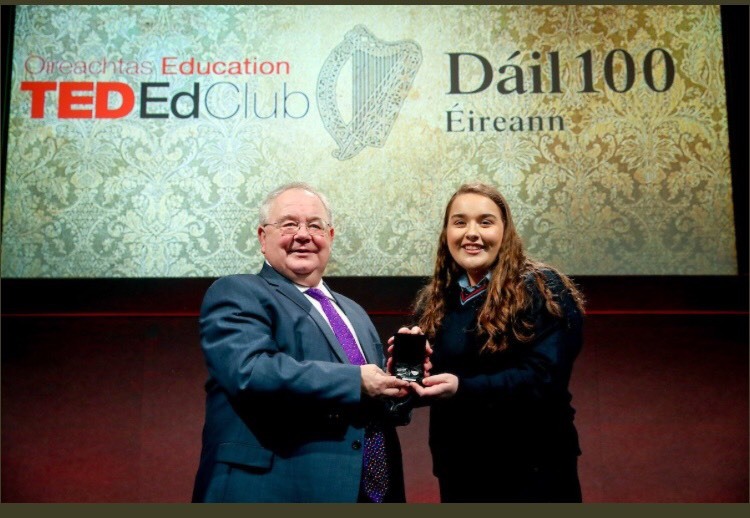 Caoimhe was one of fifteen students nationwide who was selected from a group of over 300 students to partake in the prestigious TED-Ed Club. This initiative was organised as part of the Houses of the Oireachtas programme commemorating the 100th anniversary of the First Dáil. Caoimhe spent many hours preparing for her presentation entitled “The power of one vote. Your vote”. She attended 13 TED-Ed Club lessons both online and in Leinster House, formally known as explorations, under the guidance of her teachers and Parliamentary Education Officer Conor Reale. On Friday last, 8th March, Caoimhe addressed an audience of over 300 people. Caoimhe raised a number of important points throughout her speech including how “the decisions we make today will impact all of our tomorrows.” Caoimhe encouraged all young people to utilise their vote and addressed how their vote can make a huge difference in their future lives. “There is no better time than now to harness young people’s passion and opinions through voting, which is the most effective way to create change.” Caoimhe’s presentation will be available for viewing on the TED-Ed Clubs channel on YouTube and on Oireachtas TV. TY students from Our Lady’s, Laura Christie, Maria Duffy and Tara Quinn pictured at the Dublin offices of data analytics company SAS with data analyst John Curran and Alan McGlinn. Courtesy of SAS, the girls have been given the opportunity to use a technology tool ‘Visual Analytics’ to further analyse their findings from their BT Young Scientist project ‘Absenteeism as a result of Type 1 Diabetes’. Three Transition Year students from Our Lady’s Castleblayney, Maria Duffy, Laura Christie & Tara Quinn who were highly commended in the Social & Behavioural Sciences section at the BT Young Scientist Exhibition with their project entitled ‘Absenteeism as a result of Type 1 Diabetes’ have seen much interest expressed in their project since January. Data analysts from SAS Dublin, John Curran & Alan McGlinn met the students through their Twitter account @teens_diabetes1 and made contact with the girls at the Young Scientist Exhibition. SAS is a global data analytics company with customers in 145 countries. The company’s software is installed at more than 83,000 business, government and university sites worldwide. 96 of the top 100 companies on the 2017 Fortune Global 500 are SAS customers. Their customers include Nestle, HSBC, Honda, Bank of America and Irish Tax and Customs. Analytics is the discovery and communication of meaningful patterns in data. SAS provides analytics software and tools which companies can use to analyse data and inform decision making. 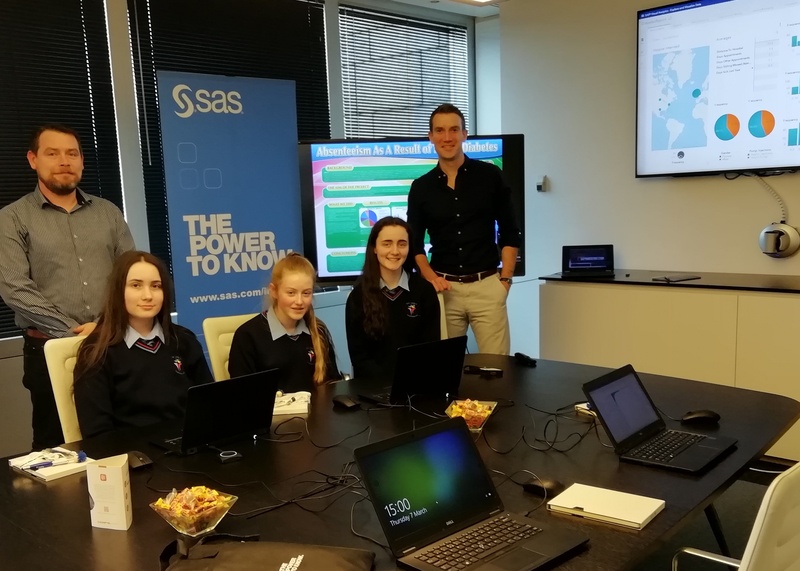 SAS technical support, Alan McGlinn invited the girls to SAS offices in Dublin to learn how to use a fantastic technology tool called Visual Analytics. This tool can be used to help in the presentation of the findings of their in-depth research on the causes and impact of absences from school, college or work of people with Type 1 Diabetes. As well as learning how to use a visualisation technology, the girls were able to examine their data in more detail which helped them to uncover some new insights from their research. They have also been given free access to the Visual Analytics program for the next few months which will allow them to continue the analysis of their data. Laura, Maria and Tara were delighted to be given the opportunity to work with data analyst John Curran on the day and are very grateful to Alan McGlinn, John Curran and Joe Kneen who had spent a lot of time working on their data and teaching them how to use Visual Analytics. They also met with the SAS UK and Ireland Healthcare Director Amy Murray and were given the opportunity to discuss their findings with her. Amy was very impressed with their work and hopes to share some of their findings with both the NHS and HSE. Science teacher, Ms Higgins who has been mentoring the girls with their project, complimented Maria, Laura & Tara on their hard work and commitment and said this is a fabulous opportunity for them to analyse their findings and get the most potential from their data. “The girls got a tour of the offices and got to talk to people in all areas of the company. It allows them to work with professionals in the world of work and gives them an insight into this wonderful technology tool, Visual Analytics. We are extremely grateful to the company SAS Dublin and Alan McGlinn and John Curran who have given us their time and expertise. Indeed the adventure with SAS is just beginning with plans unfolding every day”. JCSP classes in Our Lady’s enjoy an educational day out to the Ulster American Folk Park in Omagh. They are seen here visiting the kitchen of olden days. 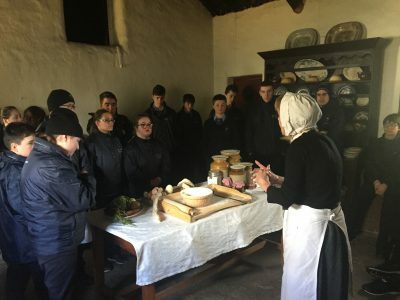 Students from the JCSP Classes in Our Lady’s had a very interesting, hands-on History lesson when they travelled to Omagh on Tuesday last to visit the Ulster American Folk Park. The students, accompanied by their teachers and SNA’s, had a most enjoyable day visiting the classroom, the kitchen, the shoemaker of olden days. Thanks to Mr McKenna, History teacher for organising the trip which rounded off with pizza and a movie. 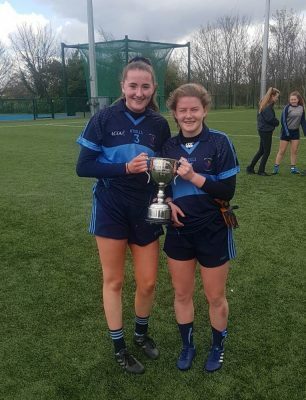 Our Lady’s won the DCU 7’s for the first time on the 2nd April. The highly prestigious tournament featured ten teams from around Ulster from fo ur different counties. The tournament featuring TY & 5th Yr students saw Our Lady’s top their group with emphatic wins over Maynooth, Mount Sackville and St Marks, Manor House. The quarter final pitted the Monaghan girls against Castleknock, after a tense and physical encounter the sides finished level with the result decided on penalties. Jayne Drury, Erin Hamill & Aoife Flanagan converted all three to qualify the girls for a semi final against Ashbourne. In a tactical battle the girls hit three goals to qualify for the final against Moate from Westmeath. The girls withstood a strong comeback from the Midlanders to run out deserving 9 6 winners and all agreed that Our Lady’s girls were deserving winners of the tournament. Joint captains Erin Hamill & Jayne Drury accepted the Cup on behalf of the squad. 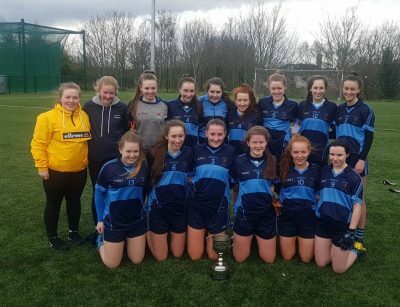 The win was a just reward for a group who have contested major finals at ‘A’ level in Ulster in recent years and will provide a platform for next year’s Ulster Senior campaign.